UV, heat, oil and bitumen-resistant. The coated monolithic film technology is vapour open, yet watertight, which in turn helps limit the effects of condensation and moisture built-up in the building envelop of a building. 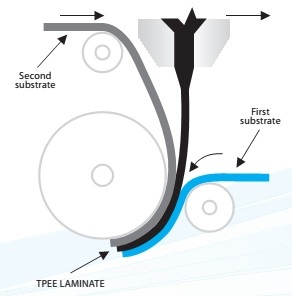 Why Monarflex developed Monarperm TP membranes? Vapour permeable membranes or breather membranes as they are called play an important role in protecting a modern building with the increased demands to building being more sustainable. The demands to higher level of insulation leaves little space for anything but insulation meaning the gap between the roofing underlay and the insulation in a warm roof construction is more critical than ever. The increased demand to upgrade buildings and especially roofs to a more energy correct way have meant that the overall cost of a roof has gone up and hence why the breathable underlay should and must perform for many years as any failure would be costly to put right. With this in mind Monarflex decided to develop a new standard for quality solution which provides long-term building protection. The conventional breather membranes on the market, also known as microporous membranes have been on the market for many years now and although the product technology possess several advantages there are also drawbacks, mainly on water tightness during long time ageing exposure to the elements, and harsh climatic conditions and chemical resistance from alkaline which can come from concrete tiles if installed under this kind of roof covering material. Monarflex have utilized its vast knowledge in developing this new kind of coated breather membranes. Now after years of research and testing the new developed products fulfill all requirements for pitched roofing membranes and have better characteristic than conventional breather membranes. 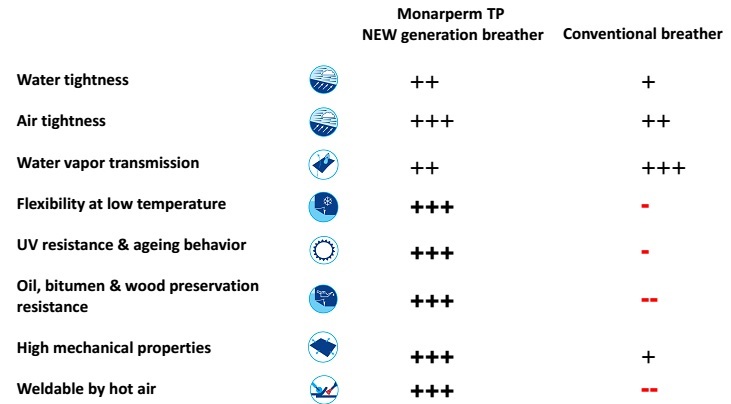 The Monarperm TP membranes gets its “breathable” functionality from its special TPEE coated film that works by an absorption – diffusion – release model. This means that when water molecules in gas form, also known as water vapour are absorbed by the amorphous TPEE layer they pass through the layer via a polar soft-block phase and therefore no physical perforation* in the structure is needed as known from the standard micorporous films. 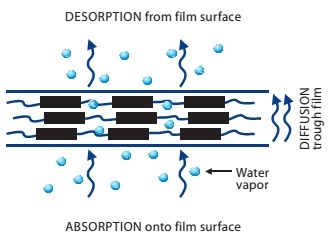 Once the absorption of water vapour molecules has been achieved, the diffusion through the film begins, and finally the release of water vapour from the film surface occurs. *)Microporous films are perforated in its internal structure by small calcium carbonate stone fragments that give it’s the porous structure. 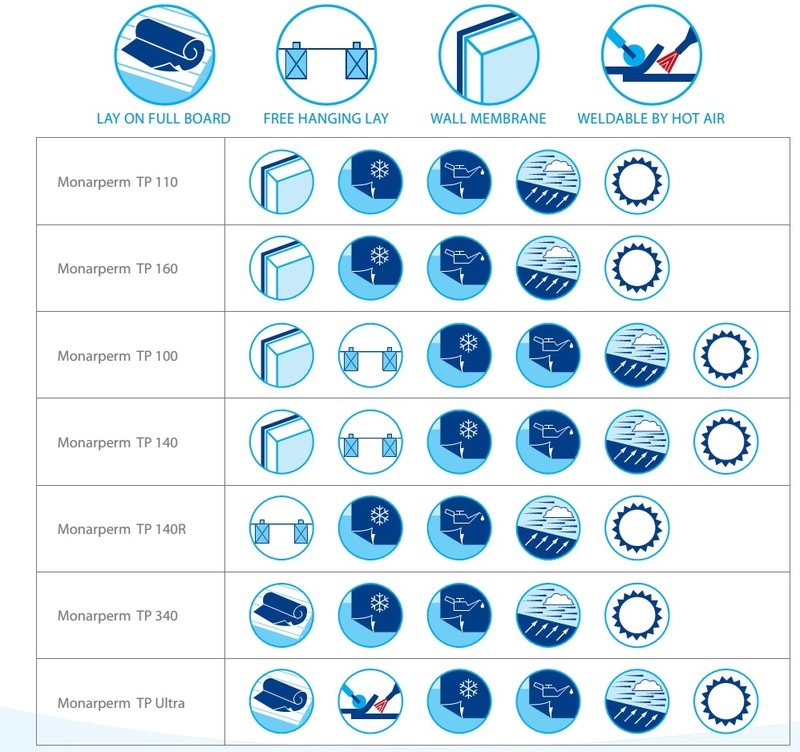 The Monarperm TP breather membranes are made from a special co-polymer called TPEE (Thermo plastic Polyester Elastomer). This mean it’s a monolithic film that are created using co-extrusion coating technology. 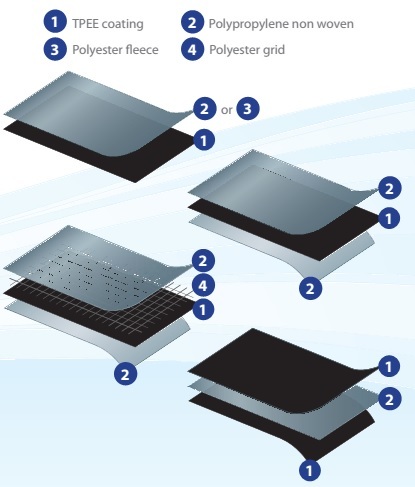 The TPEE polymer is extruded onto or in-between two layers of nonwoven or polyester fleece with or without a reinforcing grid for extra strength to form a strong and durable membrane. The TPEE polymer is ideal for products requiring excellent flex fatigue and broad use temperature like in pitched roofing underlay. It is strongly resistant to tearing, flex-cut growth, creep and abrasion. Its mechanical properties provide the strength and stiffness you need, in addition to outstanding toughness. Its chemical properties make it highly resistant to hydrocarbons and many other fluids. The membranes tested in certified laboratory and fulfil all the requirement of the following standards. EN 13859-1. 1 Flexible sheets for waterproofing. Definitions and characteristics of underlays. Underlays for discontinuous roofing. EN 13859-2. Flexible sheets for waterproofing. Definitions and characteristics of underlays. The new generation of Monarflex breathable underlays that can be installed over rafters, on hard boards, in ventilated or not ventilated roof constructions, or as underlay for walls.